Maybe you are pretty comfortable with intuition or maybe you would like to live more intuitively. Either way, the question still comes up: How do I know if it is intuition or something else? This is a good question! It means you are practicing self-inquiry. It is not self-doubt, but a real deep and honest question. What is the best way to connect with your intuition and answer this question? Living intuitively sounds pretty easy, but it is not. It sounds pretty glamorous too, and it’s not. 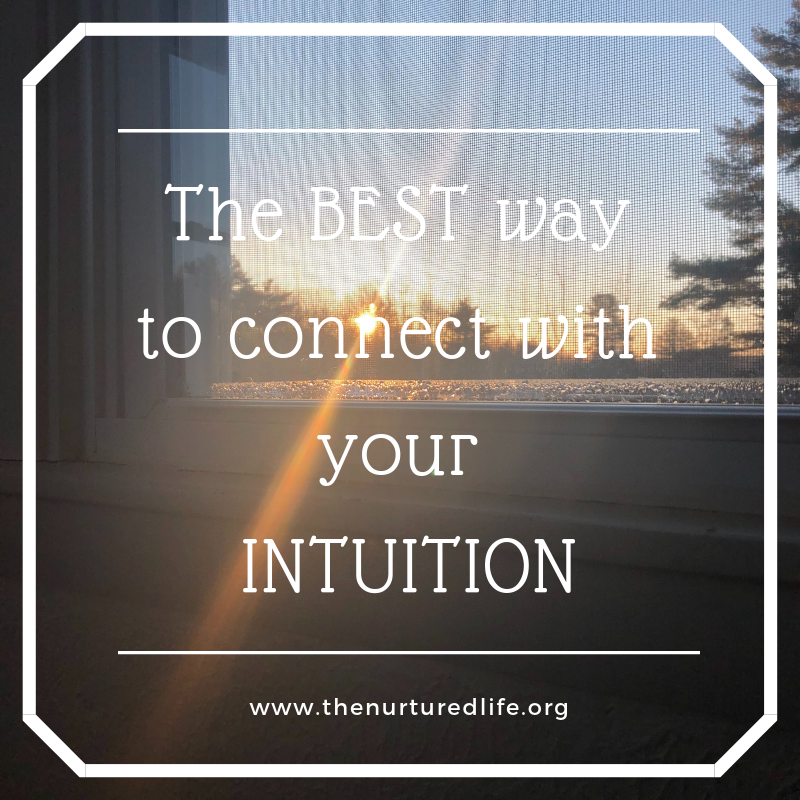 I’m going to tell you the best way to connect with your intuition but I don’t want you to roll your eyes and stop listening. Stick with me, and I will explain. The best way to connect with your intuition is practice. Boring, right? Actually, this is where living intuitively gets exciting and adventurous and fun. Living intuitively is not straightforward, and it is not doing whatever you want. It often is doing what you DON’T want. But, once you have committed to this practice you start to see the magic of connection between yourself and the whole universe. This week an opportunity arose that seemed like it was a good thing. This opportunity met all my requirements, it fit my schedule, and it fulfilled a need. I was excited about this opportunity at first, and even pursued it. But, as I started to accept the possibility of this opportunity becoming reality, I started to resist. I really, really started to resist. This did not feel right. But, it was a good thing and I should do it. AND it fulfilled those needs, remember. I needed this, didn’t I? And that’s when something spoke up to me. I remembered, because I practice intuition and self inquiry that I do not and have not ever resisted something that needed doing. My pattern is to wholeheartedly and excitedly approach any task which needs doing, no matter how hard and no matter how painful. I do not skirt discomfort and I turn it into something palatable. But, I was not doing that here. Why not? Why was I resisting this so hard? I mean, I was like actually walking around crying about this opportunity that days before I had chased. What was up? My intuition was telling me I should not do this and my practical self was saying I should. The thing about intuition is we can’t only listen when it feels good. I know it sounds like here it felt bad, but what actually felt really scary was turning down this opportunity without knowing what would come ( if anything) next. My intuition was telling me to wait and say no, but that was really uncomfortable. I wanted to say yes ( and fill up those needs) and I wanted to tell myself that my bad feelings were make believe. AND, I could have. BUT, I chose not to. I decided that I have had a lot of practice listening to my intuition and even though this was a really big thing, I needed to trust my inner voice over my head here. So I did. I called and turned down the opportunity. I shut that door. Immediately, the anxious concerns coming from my intuition calmed. I was happy. I was happy I had turned down this chance and opened up room for others. I was happy despite having lots of unanswered questions and lots of needs that needed meeting. Throughout the rest of my evening I felt only relief that I had closed that door. That night, I slept all through the night for the first time in weeks. My inner voice was at rest, she didn’t wake me up in the middle of the night. And because I have practiced living this way, I know that means everything is okay. Without practice, I couldn’t trust. That’s what trust is, it is experience built upon by experience that provides a sense of truth. Luckily, living a mindful life is a very custom educational plan. Each step on your journey leads to the next. Your intuition is never going to ask too much of you, and your mindfulness practice and self-inquiry is never going to be more than you are able to handle. Each little jewel we find along the way helps us on the next deeper, steeper part of the path to enlightenment. Each step deeper within ourselves connects us more deeply with all there is. The only way up is down, the only way out is through. The only way to know is to take up the practice. The best way to deepen your intuition is to get intimate with yourself.